In celebration of Ansell’s values and to commemorate International Human Rights Day, the company celebrated ‘World Human Rights Day 2017’ for all staff recently. Dr. Prathiba Mahanamahewa, Former Human Rights Commissioner, was the Chief Guest at the event and delivered a thought provoking message on human rights to all employees. Other special guest at the program was Mrs Renuka Dasanayaka, Senior Deputy Director, Industrial Relations BEPZ, Board of Investments of Sri Lanka. 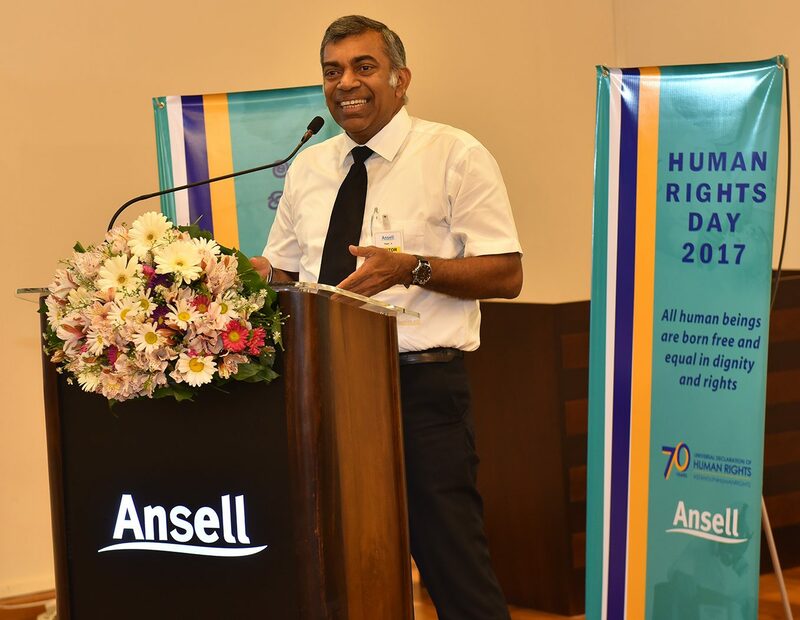 Approximately 4000 staff at Ansell Lanka, Biyagama and Ansell Textiles Lanka, Seeduwa manufacturing sites observed the special day with a communication campaign on human rights using banners, posters and other messaging. The main objective of the programme was to raise awareness and educate employees on human rights. World Human Rights Day observes the day on which, in 1948, the United Nations General Assembly adopted the Universal Declaration of Human Rights (UDHR). As a responsible corporate citizen, Ansell operates in accordance with the Universal Declaration of Human Rights (UDHR), the foundational document establishing human rights for all. Ansell also takes into account the United Nations Guiding Principles on Business and Human Rights (The Guiding Principles), and applicable ILO labour standards. Ansell believes that human rights are basic rights inherent to all human beings that form the foundation for freedom, justice and peace, and which apply equally in all countries. As a socially committed company, Ansell continuously promotes and respects human rights within its spheres of operating influence. Ansell’s Human Rights Principles and Responsibilities are enshrined in its Human Rights Statement. Additionally, the company communicates and reports on human rights activities via Annual Reports and the Ansell.com website.